This is THE ONE Bible Every Christian Should Own…! That’s what my Homiletic’s professor declared to the whole class. Another student had asked what we should do if we wanted to be good pastors. “Get books, big books, thick books, good books, lots of books and read them. Sell your bed if you have to, but get books and read!” Much to the chagrin of my young bride, I bought that one hook, line and sinker. His admonition helped to forever alter the course of my money. My freshmen year in college I bought over $700 worth of Biblical reference works (back in the mid 80’s!) that I was not required to have for class! I didn’t sell the bed (though I would have definitely traded it for Kittel), but I did eat a lot of popcorn for breakfast. So began my love affair with books. I discovered that his assessment was right on during my first year of being a pastor. People did believe what I taught! That reality solidified my devotion to spending every spare penny on getting more books for my library. I took teaching His word seriously. You don’t have to know Greek and Hebrew to become a faithful Bible student. But I would be misleading you if I said that it doesn’t help. It does! However, there are some helpful things one can do to get the idea of what the Greek or Hebrew might say. The answer is easier than you might have realized and it is simply this: Compare different Bible translations. If you just read one translation you often will fail to see the nuances of words. But if you look at a passage from several different translations you see how the translators are engaging with the words. All translators make thoughtful choices on the english words they use in the translation process. Comparing their translations help you come away with a much clearer picture of what the Greek/Hebrew may say. 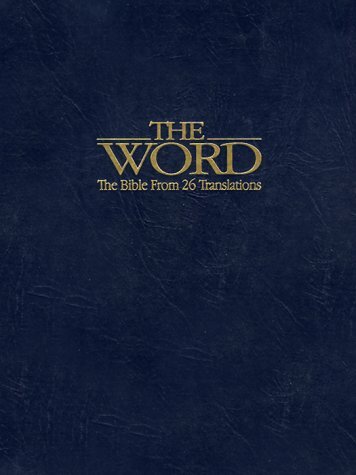 Back in 1994, I purchased “The Word: The Bible from 26 Translations” at a Bible Conference for $50. At the time, I didn’t know that it would become one of my most treasured library books. But it has! It seemed like such a great idea and I bought it on a whim. “The Word” contains the complete KJV text of the Bible (not my preferred version) and adds helpful insights from 25 additional Old Testament and New Testament English translations. Some of these translations are hard to find and not sold at the local Christian “bling” I mean “Book” store. It doesn’t have have the NIV or the ESV but that’s ok, as you probably already have these on your bookshelf. It does this for the entire New and Old Testaments and it is VERY helpful. I have a lot of different translations on my bookshelf, but this is the one I go to first. It isn’t cheap, but it is worth every penny. If you have to sell your bed to buy it, you’ll be glad you did. Posted on September 30, 2011, in Christianity, Contemporary Church Culture, The Christian Life, Theology and tagged bible, bible study, books, christianity, devotions, El cristianismo, ESV, faith, inspiration, religion, The word. Bookmark the permalink. Leave a comment.